14 members from the Takaoka Regional Restoration for Cultural Properties Association in Toyama Prefecture. The Art Research Materials Section of the Department of Art Research, Archives, and Information Systems has been conducting a research project involving Documentary Research on Cultural Properties. This project seeks to reveal the diversity of value systems expressed in art from Japan and other parts of East Asia by analyzing primary materials. One of those primary sources consists of about 7,400 letters addressed to KURODA Seiki. These letters are curated by the Institute, which has been organizing and itemizing them. Research on letters addressed to KURODA Seiki has been conducted as part of this project, and one result of that research was a seminar that was held on August 6. The seminar was based on letters from students from parts of Asia, such as China and Korea, who were studying at the Tokyo Fine Art School and who were taught by KURODA as well as letters from the painter FUJISHIMA Takeji, who was closely associated with KURODA. During the seminar, YOSHIDA Chizuko (Tokyo University of the Arts) delivered a presentation entitled “Photographic Reproductions and Reprints of Letters from Foreign Students Addressed to KURODA Seiki with Annotations” and Kaoru KOJIMA (Jissen Women’s Educational Institute) delivered a presentation entitled “Letters from FUJISHIMA Takeji addressed to KURODA Seiki and KUME Ichiro.” YOSHIDA’s presentation covered 6 letters from figures who studied at the Tokyo Fine Art School and who then became highly active in the art world in their own respective countries. 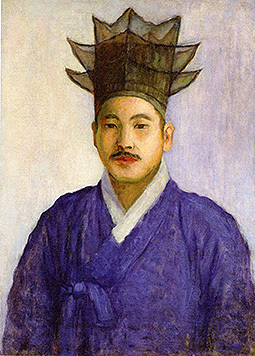 One such figure was KO Hui-Dong (1886–1965), a student from Korea. YOSHIDA’s presentation described the students and the contents of their letters. KOJIMA’s presentation, based on 37 letters from FUJISHIMA that are curated by the Institute and letters in the collections of other facilities, covered communication between KURODA and FUJISHIMA Takeji as the latter accepted his post in the Department of Oil Painting of the Tokyo Fine Art School. This growing closeness between FUJISHIMA and KURODA and KUME has not been noted in previous research on FUJISHIMA Takeji. KOJIMA’s presentation also corroborated the personnel situation at the Fine Art School. Plans are to subsequently feature the results of research by both presenters as Research Materials in Bijutsu Kenkyu (The Journal of Art Studies). The Survey Report on the Oceania Island Countries has been published. These surveys took place last year as part of a project on International Contribution to the Protection of Cultural Heritage (expert exchanges) commissioned by the Agency for Cultural Affairs, Japan. The Republic of Kiribati and Tuvalu face the potential effects of rising sea levels due to climate change. The report primarily contains photographs of cultural heritage in these 2 countries and the state of that cultural heritage. 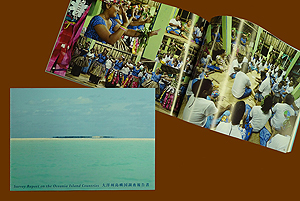 In addition, a project on protecting the cultural heritage of island countries in Oceania was implemented last year as a Networking Core Centers for International Cooperation on Conservation of Cultural Heritage Project. 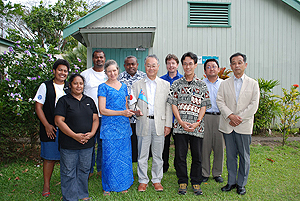 Personnel from the Institute visited the University of the South Pacific in Fiji, a key country collaborating with the project, on August 8. Personnel met with Elisabeth A. HOLLAND, Director of the University’s Pacific Centre for Environment and Sustainable Development and discussed signing a memorandum on scholarly exchanges between the Institute and the University of the South Pacific. In addition, results of surveys of intangible cultural heritage primarily in the Republic of Kiribati and Tuvalu were reported and representatives of the Pacific Centre expressed their views. Through this project, the Department of Intangible Cultural Heritage will continue to teach and train personnel in order to document and protect the intangible cultural heritage of island countries in Oceania. The Department of Intangible Cultural Heritage conducts scholarly exchanges with South Korea’s National Intangible Heritage Center. This year, KIKUCHI Riyo studied the current state of the passing down of Korean textile techniques over a 2-week period starting on August 18. Information on “Materials and Tools” is essential to the passing down of textile techniques. Even if finished pieces look the same, use of different materials and tools can change the way the pieces were made (how they were made) and thus affect the technique used to make them. 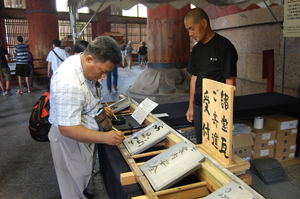 In Japan, there are currently no requirements for an individual to be designated as an important intangible cultural property (a living national treasure) under the Act for the Protection of Cultural Properties. This is presumably because the type of material selected and the choice of which tools to use to produce an item are essential aspects of being designated as an important intangible cultural property. In contrast, designation as a preservation society involves requirements that limit the materials and tools that can be used. This is the major difference between designation as an individual and designation as an organization. Restrictions on materials and tools that can be used affect the production of items in various ways. 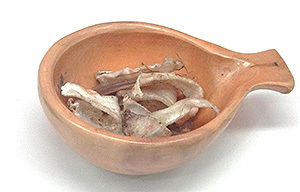 This is because changes in lifestyles have made some materials and tools hard to obtain. In light of the current circumstances in Japan, interviews regarding materials and tools were conducted in South Korea. These interviews covered gilding, braiding, sewing, cotton fabric-making, and indigo dyeing techniques, which are designated as important intangible cultural properties in South Korea. These techniques are also found in Japan, but the materials and tools used differ. A look at gilding, for example, shows that in Japan glues made from seaweed, rice paste, or starch paste were used to affix gold leaf to a form or mold fashioned from Japanese paper coated with persimmon tannin. A different technique has been passed down in South Korea, where gold leaf is affixed to a wooden mold with glue made from the swim bladders of the Honnibe croaker. Conditions have changed, making this fish glue harm to obtain. The type of material selected and the choice of which tools to use to produce an item are essential aspects of being designated as an important intangible cultural property in Japan, and the current interviews indicated that the same holds true in South Korea. In both countries, the supply of materials and tools changes on a daily basis. The techniques that make crafts possible must be passed down so that materials and tools that were used in the past are still available. The current interviews revealed that the passing down of these techniques is an issue that both South Korea and Japan must deal with. A program for training in conservation of historical wooden buildings has been conducted since last year pursuant to the Networking Core Centers Project for Protection of Cultural Heritage in Myanmar, commissioned by the Agency for Cultural Affairs, Japan. As part of the program, personnel were invited to attend training in Japan for the first time. Among the participants in ongoing field training in Myanmar, 3 personnel from the Department of Archaeology and National Museum (DoA), Ministry of Culture of Myanmar visited Japan from August 21 to 30. 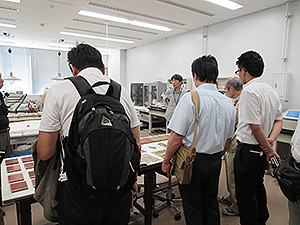 The primary goal of this training session was to further explain to trainees the concepts behind conservation of historical buildings in Japan and the realities of conservation projects. 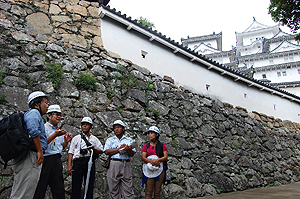 In addition to receiving classroom lectures on basic topics, trainees visited sites in the Kansai region and elsewhere where historical buildings were under restoration work. Trainees heard from specialists who managed restoration work and they learned work procedures as well as specific techniques for surveys and conservation planning. Sights such as first glimpses of sites where major conservation efforts were underway and methodically arranged building components made a substantial impact on trainees. Trainees learned a number of things by enthusiastically asking questions on-site and through practice. Trainees showed considerable interest in techniques to meticulously survey and document buildings during conservation work and in the careful work done by carpenters. Clearly, the techniques used in Japan cannot be immediately adopted in Myanmar. However, this training session was a valuable experience for the trainees since it encouraged them to think about how they would preserve and pass on their own cultural heritage in the future. These trainees, after all, will be responsible for conservation of historical wooden buildings in Myanmar. Plans are to conduct additional cooperative projects to help protect the cultural heritage of Myanmar.